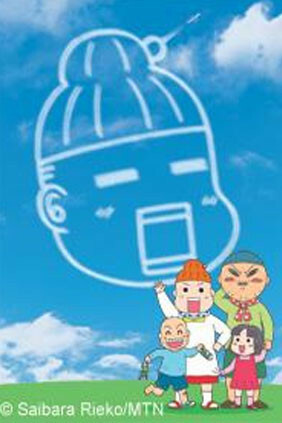 Kaasan, Mom's Life is a very adorable and very funny show that is slightly remicisent of the days of Azumanga Daioh. With no real over-arching plot, it attempts to portray the life of Kaasan (Japanese for mother), who is a comic book artist and the mother to two children, Bunji, the oldest, a boy, and Fumi, a girl. Her husband is a war time photographer and her grandmother lives in the house to help take care of children while Kaasan is working away. This show is a great slice of life show that will give you some more insight into Japanese life for housewives, such as the desire to have children educated at an early age, and the reality of grandparents living in the home and the life of an absentee father (he is either working or really drunk). Though reading this you might think it's a very heavy show, but the tone is light and amazingly fresh. The voices are dead-on perfect, animation is amazing (especially if you're an Anime Member, you can watch this series in 720p, which is stunningly beautiful!) I recommend this series to anyone who loves the slice of life genre, a great addition! In all my life, it was rare to find a series that mixed laugh-out-loud comedy with poignant elements that brought me to tears. Doraemon, the classic series, was the only series back in the day that could do it, and even watching those old episodes, it still does it. But Mainichi Kaasan/Kaasan Mom's Life is like that, albeit without the fantastical elements of the miraculous pocket and a robot cat from the future. It's a story of a mother, a pretty normal mother, one can believe, and her challenging life. She must balance her career outside the home with her domestic obligations, and she finds herself learning about life even as she teaches those same lessons to her children. Somehow, each episode combines hilarious comedy with moving poignance that extends far beyond cultural boundaries, so that anyone watching will easily be able to understand the real weight of what is conveyed. I was really impressed that, in the space of a single 20-something-minute episode, I could go from loud laughter at a game of shiritori gone horribly wrong, to bawling my eyes out when Kaasan tried to explain to her daughter about what happens when people pass away. But instead of being manipulative and cheap, it was really something that I felt actually accomplished its intention, which is extremely rare in any medium. This series is one that can surely amuse anyone, regardless of age, but I think it will probably be most meaningful to those of us who have had some experience in life and can at least understand, even if we ourselves haven't experienced the same life, what Kaasan goes through. It's a really lovely series and, though it's not for everyone, will really mean a great deal to those of us who find it, watch it, and find ourselves feeling very deeply for a character who reflects so much of our own lives. You call her "kaasan" and you mean it. This is a beautiful and amusing series. While the art may not look as well-done as most anime, it is in itself a reflection of what this anime is about: daily, real, imperfect lives. Simple, seemingly awkward outlines filled with the colours of family memories. What it lacks in art detail, it abounds in story and character depth. And I honestly think the "lack" is intentional. It makes the series more lightweight. Rieko Saibara, the author of the manga series, has the following motto: "If you have time to whine, it's much better to just laugh it off". And laugh it off we do! Time and hindsight turn tragedies into comedy. Now we laugh at it, but at the time it happened, it was much worse, we stressed, cried, argued over it. The way Rieko narrates and shows the events makes us feel welcomed, like a long-time friend, or even a family member, sharing stories over the dinner table. Because these are (fairly) real stories, those who are not familiar with Japanese daily life can get a glimpse of the struggles that are not often portrayed in more mainstream animes, with some episodes even giving clues to the current sociological situation in Japan (what is socially expected of men, women, children, parents, grandparents, neighbours, friends?). This series makes you feel you're there, that you're almost a part of the family; consequently, you end up calling the characters "kaasan", "toosan", and meaning it. Also, the mom of the anime is hilarious! How can you not love her?! The anime is extremely hilarious with the troublesome children and the character design. Although it would msot likely attract alot more viewers with normal anime style, it 's really a great anime. Although I haven't seen the whole show yet, Kaasan-Mom's Life really is pretty cute. It's just a funny series following this manga artist mom and all the crazy stuff her family does. Although the humor lingers on the edge of Japanese humor (that isn't really as funny to Western audiences), it's still pretty adorable; and it may not make you fall out of your seat, but you'll still laugh anyway. It also has its serious scenes, where Kaasan isn't being driven insane by her family but rather admiring them during peaceful moments. It's a sweet show and worth watching if you need a little laugh or if you're just looking for something with a plot that's easy to understand. Great anime if you want to know more about Japanese Culture! This is the perfect example of why we shouldn't judge a book by his cover. I started watching the first episode and I didn't care that much at the beginning: I didn't like the designs or the animation that much. Now, after a few episodes is one of my favorite anime. This show is great because it shows you a lot regarding Japanese culture from the eyes of a common Japanese mom. The show is really funny, and you will feel sympathy for her quickly if you have kids or if you are like my and you had to take care of your younger brothers.